The Alaskan drill is designed to work on lead passing and communication. If a player is on there backhand when they are doing the drill make sure they stay passing on there backhand. Get players to alternate lines so they will pass on their backhand and forehand. Players line up in two lines in the middle of one end of the ice. The first pair leaves and passes back and forth to each other down the middle of the ice. The player with the ring at the opposite end takes a shot at the net. Both players curl into their respective corners and grab a ring. They give a pass to an instructor in the middle and receive it back and drive in for a shot on net. Then they get back in line. 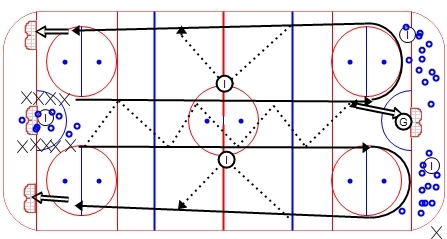 * Coaches must constantly be moving rings down the ice to the end with the net because players take down 1 ring and bring back 2. No Replies to "Alaskan Drill"